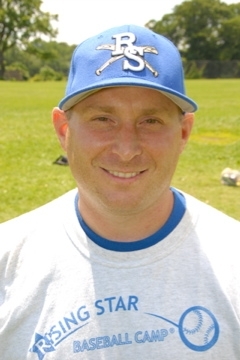 Coach Anthony DeLuke has been field director of the Single A Field at Rising Star Baseball Camp since 2008. Anthony Deluke has been the head baseball coach at Albert Leonard Middle School since 2000. His team has compiled a remarkable 67-8 record over the past six seasons. Most notably, Coach DeLuke's team only lost one game during a four year stretch. Current professional player Matt Duran (NY Yankees), played two seasons for Coach DeLuke's powerhouse ALMS Leopards. Coach DeLuke was a standout high school athlete in football, wrestling, and baseball in Muscoda (upstate New York). He went on to play NCAA baseball at nationally-ranked Ithaca College where he majored in physical education. Coach Deluke is a physical education teacher at ALMS. Since starting his camp coaching duties as Single A Field Director in 2008, he has helped many players successfully progress to the Double A level through unique drills, mental approaches to improved performance, and effective baseball mechanics. Coach DeLuke is a gifted instructor and well-rounded as a teacher of baseball fundamentals as well as a variety of other sports. Personal: Resides in Norwalk, Connecticut with his wife Shelby and their two daughters. Enjoys competing in tri-athalons, camping, and spending time with family.